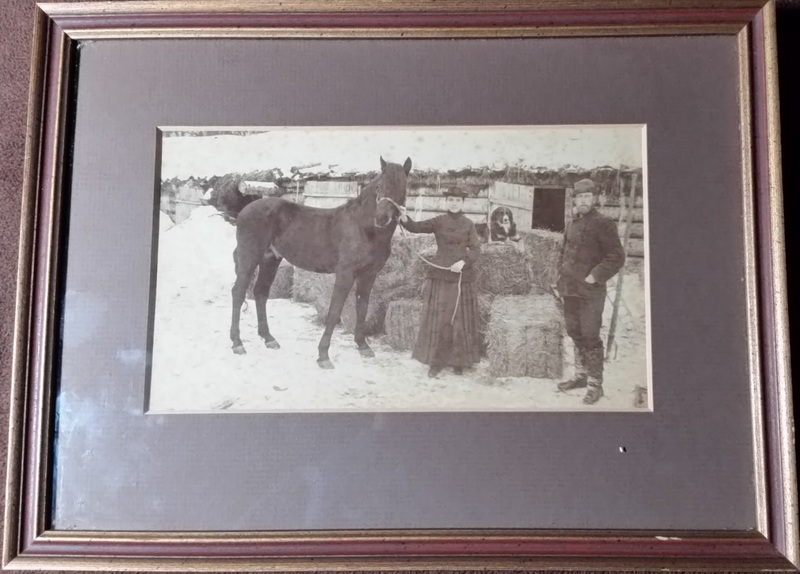 Framed photograph of a young couple, horse and dog, identified on the reverse, in a contemporary hand and ink, as John R. and Hattie Flint, dog "Snicks" and a horse at the lumber camp of John's father Levi C. Flint. The identification indicates that the photograph was taken about 1900, but I believe it was earlier, perhaps dating as far back as 1884, when John and Hattie married, perhaps before the birth of their son Levi Richard Flint in 1893. John Rice Flint was born March 1, 1862 at Monson, Maine, son of Levi C. Flint and Sarah Elizabeth (Rice) Flint. On May 30, 1884, John married Hattie Wilkins on May 30, 1884. Hattie was born in Canada about May 1865. Her brother, George Hargraves Wilkins, who managed the Portland-Monson Slate Company, was living in the Flint household at the time of the 1910 Census. The Maine Memory Network has a photograph of the Captain Peabody Harriman Rice farm, circa 1890, shown here and here, which his grandson, John Rice Flint, would purchase in 1896. 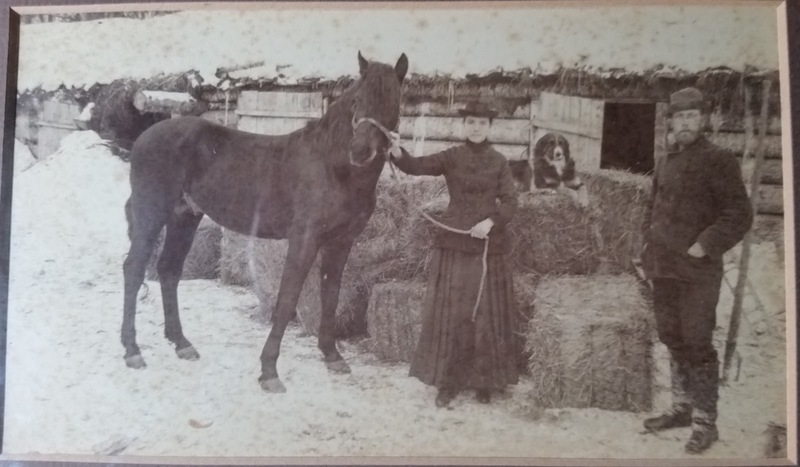 The second photograph shows someone mounted on a horse with no markings, perhaps the same horse as in the photograph featured in this post. John Rice Flint was a lumberman and served in the Maine Legislature from 1917 until 1925. He and Hattie had at least one child, Levi Richard Flint, born September 19, 1893. John and Hattie lived at least to the age of 80, as they're described as octogenarians who participated in a Monson street dance to celebrate the end of World War II. 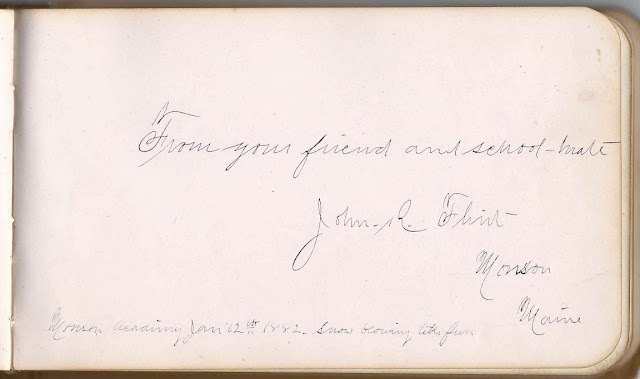 Interestingly, another post features the 1880s autograph of Wallace Homer of Monson, Maine, a schoolmate of John Rice Flint. John inscribed a page in the album in 1882.